Chemicals undeniably are very important in life. From the example of organic compound uses to inorganic compound, each has its benefit to mankind. However, the advantages always have the other side that is less fruitful as well as dangerous to human. Some chemicals in agriculture for example, turns out to be dangerous to human. The use of them can affect the health of human. Those effect can be either short term or long term. Thus, we need to be aware of the danger the chemical exposes. Environmental chemical is the type of chemical utilized for the environmental development or any substance that directly affects the environment. The example of these chemicals is pesticide, fertilizer, water purifier, and chemicals end up in environment. 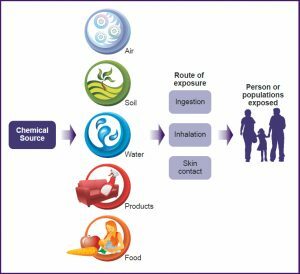 Thus, what is the effects of environmental chemicals on human health? Here is the list. The first health reaction commonly found in human when they come in contact is allergy. Chemicals of course is still a strange substance and if the immune system resists to be contaminated by it, it can cause allergic reaction. The allergic reaction varies from skin allergy such as itching, rashes, hot red spot and many more to eye allergy and for worse case is allergic that includes internal organ. The latter for example is some chemical can trigger asthma, short of breath, or runny nose. The allergy is usually treatable but there is still possibility that it can harm someone’s life. That’s the harmful effects of environmental chemicals to human health. Another effect of environmental chemical to human health is digestive problem. Not every chemical is soluble in water. Some pesticide stays in the plants and when it enters human body, especially the digestive system, it may upset the stomach and cause digestive problem. The victim can feel nauseated, pain in the bowel, diarrhea, and many more. This is why someone needs to perfectly clean any vegetables or fruits that come from non-organic source. Even then most people do not show immediate symptoms but accumulation surely will make it worse. This very health problem is common among factory workers who get exposed to the chemical in daily basis. Some heavy chemicals leave residue in lungs and people may start developing respiratory problem. The problems can be a difficulty to breath, infected trachea, sore throat and what worse is chronic lung problem. This is why factory workers should wear mask. Not only factory workers that are affected but people who inhale the waste of chemical coming from factory chimney is also in danger. The effect may not be immediately, but surely, the symptoms can turn more apparent when it is too late. When it comes to internal organs, they are mostly vital parts that sustain human life. Thus, if chemical endangers one of them, some dysfunctional or malfunctional organs can occur because chemicals damage it. There are some hazardous effects of environmental chemicals to human health. Cancer is among the deadliest effects of environmental chemical to human health. Some bio pollutant as well as insoluble chemical such as cadmium, asbestos, mercury, and many pesticides are on the list of probable carcinogen. Those chemical works by blocking the growth of new cell and caused the cell exchange lower by creating malicious cell resulted from strange chemical invasion. And the cancer can vary from lung, breast, throat and many vital organs within body. Even the sun ray is also probable carcinogen for skin cancer as it has ultraviolet radiation. (Related to List of Chemicals Known to Cause Cancer). Some chemicals like cleaning chemicals are too harsh for the skin. They can cause various skin problem as skin is sensitive and fragile to strange and toxic chemical. Some skin problem that may occur when come in contact with harsh chemical is rashes, skin burn, skin peel, black spot, and for worse case is melting skin that cause permanent disfiguration. Seeing how dangerous some environmental chemical to skin, use glove and other personal protective equipment to protect the skin from harsh chemical. Another possibility of harm from environmental chemical is poisoning. Human should not be frequent directly contact with chemical. If a human inhale, digest, or touch some chemicals, it can cause poisoning. The poisoning vary from light one with symptoms such as nausea, red eyes, and dizziness too serious case such as sudden death. Seeing how some environmental chemical can inflict human health, it is better for human to keep themselves updated with the list of harmful effects of fertilizer and pesticide as well as the effects they have. Also, personal protective equipment is a must when it comes to dealing directly with chemicals. Not every chemicals can cause serious health problem but sometimes the effects can show up later. Also choose wisely the food source you eat as nowadays many food products are in chemical contamination. Indeed, there are 15 harmful effects of environmental chemicals to human health.